Fond of Snape » Blog Archive » what is it with shiba inus, anyway??? 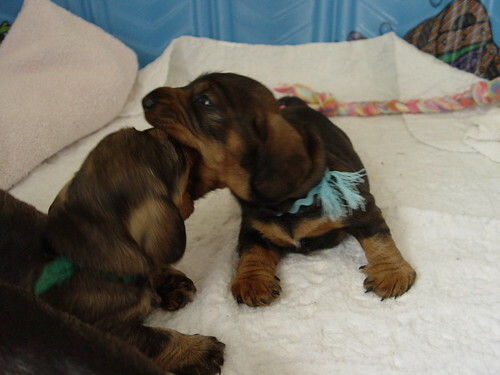 why must you torment me so with pictures of dachsie babies??!!! ack! Cute puppies, but the lobster . . . mmmm! Cute puppies. Glad Wolf is ok. Cute puppy pic! Puppies, lobster and crafts – you guys had a great day. I hadn’t realized the crafts fair came around twice a year. More like 3 times a year Robin. It was great to have you here my lovely cousin! Love your hair cut. It is fabulous! Glad Wolf was okay, I think the poor boy has an excellent memory and is worried sick he may be left again. Miss Pink is friskier today, but still having a problem. Oh wolfie! Always wanting Mama’s attention. Did the doc say anything when he went for his check up on Sat? Kinu was moody like the sounds of Wolf & she definitely had an only-on-my-terms gene … I used to think that had a lot to do with where she came from, but after this, I’m thinking she was a true blue Shiba. What do you think is going on with Wolfie? Everything OK with his vet appointment? OMG, those puppies are so freaking adorable! Ohh Wolf was MAD that he got left in the car! I hope it’s nothing more serious than a temper tantrum! Sounds like a great time was had by all except for Wolf! The puppies are beautiful!!! And, that lobster looks darn good! Love the flower, didn’t do this meme this week, but plenty of flowers and Oliver to. I did Friday Fill in late but it’s up. Oh yes, I won in court, of course this kind of win is never a happy one even so a friend tells me “weak men need to be hurt” yea! This might be why I have a cat instead of a dog. She is always happy to see us come home (assuming we’ve been away for at least a day – it takes longer for the absence makes the heart grow fonder stuff with cats). On the other hand, the last day and a half of moving here, she meowed in the car… a lot. I hope Wolf is just giving you grief for abandoning him, and not because he is sick! Lobster looks incredible delicious. My mouth is watering, you lucky New Englander, you!! I’ve said it before & I am sure I’ll say it again: I wish babies & dogs came with thought bubbles over their heads! I think Wolf was in the midst of a canine panic attack. Even that luscious lobster couldn’t bring him out of it. 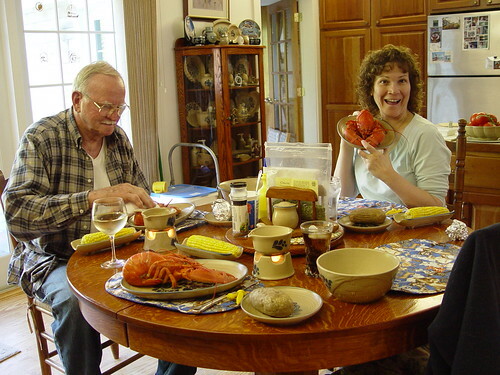 (holy-moly and that lobster looks yum!) Poor lil’ poppet, Wolfie! BTW: that munching puppy is adorable! He turned down lobster? Oy. Is Wolf acting better now?